The STM32F303 + ice5 is a small (2.5" x 1.8") board with an STM32F303CCT6 MCU and a Lattice ice40 Ultra or Ultra PlusFPGA. USB, Micro SD, PMOD and GPIO interfaces allow development of complex projects in control and signal processing. 5x Diagnostic LEDs (1 MCU user defined, 1 Configuration status, 3 FPGA user defined). USB Full-speed device (mini-B connector) with interface reset circuit. Micro SD card slot with SPI interface to MCU. Analog and Digital GPIO for the MCU. 6-pin ST-Link standard SWD programming/debugging port. Lattice ice40 Ultra and Ultra Plus parts can be configured either from internal OTP flash or externally. 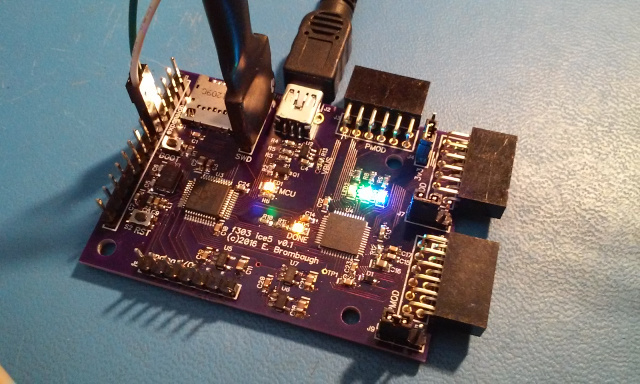 This board allows the STM32 processor to configure the FPGA either from on-chip flash (the Ultra configuration bitstream is ~70kB and Ultra Plus is ~105kB, either of which fits easily into the 256kB on-chip flash) or from the micro SD interface. STM32 Standard Peripheral Library for STM32F30x: Manufacturer's low-level C driver code. dfu-util: Simple Linux application to program STM32Fiend via USB DFU. This board provides plenty of horsepower for DSP. The iceRadio project demonstrates some of the things I've been able to do with it. 2016-06-30 - PCBs back from fab. 2016-07-02 - PCB assembled and verified. 2016-07-02 - Web page created. 2016-07-04 - Web page updated with GitHub project link. 2016-07-20 - Added paste mask for stenciling. 2018-01-21 - Confirmed to work with Ultra Plus.